The Musée Zadkine is a museum dedicated to the work of sculptor Ossip Zadkine (1890–1967). It is located near the Jardin du Luxembourg in the 6th arrondissement at 100 bis, rue d'Assas, Paris, France. The museum also contains a fine garden that is open to visitors. The nearest métro and RER stations are Port-Royal and Vavin. Zadkine Museum is one of the 14 City of Paris' Museums that have been incorporated since January 1st 2013 in the public institution Paris Musées. The Musee Zadkine makes for an unexpected little gem of a Paris museum. In addition to being an art museum, the Musee Zadkine is worth visiting just to see a country house in Paris. It's dedicated to Ossip Zadkine, Russian Parisian sculptor and central figure in the Ecole de Paris art school. 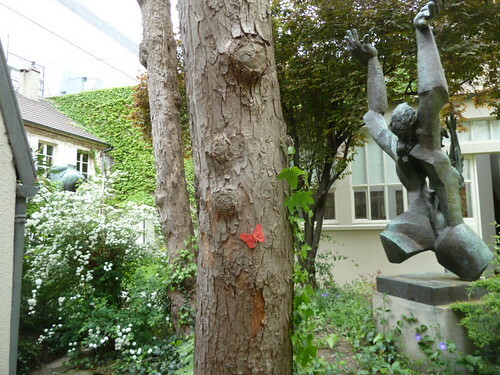 The Zadkine Museum is located in his actual home cottage and showcases his varied taste in art. His intimate cottage has around 300 sculptures and 100 paintings on display, along with a beautiful sculpture garden to relax in. View Larger Map http://www.paris-walking-tours.com/zadkinemuseum.html Zadkine Museum, where Russian-born artist Ossip Zadkine lived and worked during his last 38 years. A collection of over 400 works. Location, map, hours, fees, photos.